6 Top Ways Bloggers Can Make Big Money! I think one of the top questions I get from people is “how do I make money blogging”. It seems so mysterious. They go to your website to read the posts you write, “like” your activity on social media, and they might even subscribe your email list. However, they simply don’t get the financial part. How do bloggers make their money? I understand the confusion and curiosity, blogging is very different than getting a weekly or bi-weekly paycheck from a “normal” job. The good news is blogging can bring in a significant income – most likely more money than you could ever make working your day job. The bad news is the money doesn’t magically show up in your bank account every two weeks. You need to seek out the income streams that work best for your blog and then put in the effort to make it profitable. It does take time to build a consistent steady blog income but if you’re willing to put in the time, and work, then you’ll experience the rewards. In this post I’m going to share the 6 different income streams that are available to bloggers. Keep in mind, not all income streams will be a good fit for your blog but these are your options. 6 Top Ways Bloggers Can Make Money Blogging! There are mixed emotions when it comes to using advertising as a way to make money from your blog. Some people think it’s too intrusive, other’s think the blogger is selling out, and some don’t care. Even some bloggers are on the fence too – although it’s usually the bloggers not making money that seem to not like advertising. Personally, I think advertising is a great way to make a passive income from your blog. Our society is accustomed to advertising – we see it everywhere. Every time we turn on the TV, drive on the highway, listen to the radio, and simply live ours lives we experience some form of advertising. It’s not any different with the internet, and that includes blogging. 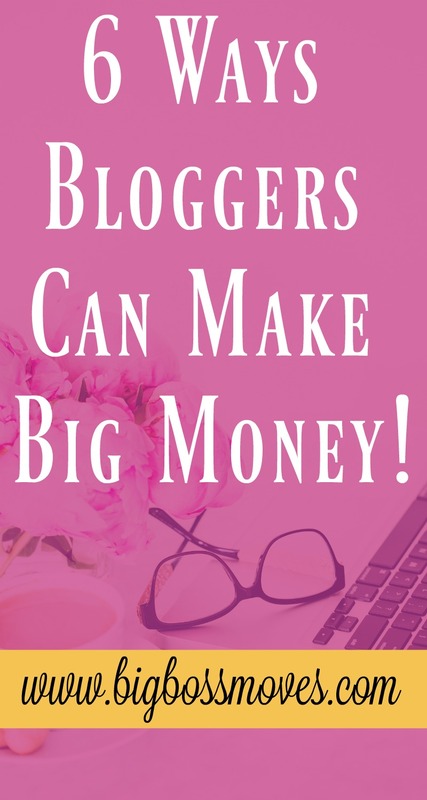 Bloggers put in a lot of work and have every right to make money from their blogs. If they use advertising as a way to make money off the FREE content they offer to their readers then that’s their choice to do so – and I support that 100%. Anyway, here are my thoughts on advertising along with some tips to get started. Advertising is the easiest way to make an income from your blog in the sense that you simply place a few banners on your site and then go about your business. However, the problem is you won’t see any real money until your blog reaches about 25k – 100k pageviews a day. Without getting into all the details about how advertising works (that’s another post) I’ll just give you some basics. There are 2 types of ads you can put on your blog – CPM ads and CPC ads. CPM ads means “paid per 1000 page impressions”. So basically you’re paid a fixed amount depending on the number of times someone views that ad. Depending on the ad campaign this can be between $1 to over $30+. Of course, it can be more or less but those are the numbers I’ve experienced. CPC ads mean cost per click, so every time a person clicks on that ad you get paid. When I first started out, my advertising income was miniscule. However, once my blog grew, and I moved to a high quality ad management company (I’ll talk about that in second), I started to make a significant income through advertising. My pageviews on Organize Yourself Skinny currently range between 500k – and some months over 1 million. On average, I make about 10k a month in advertising income. So there’s great potential with advertising but it’s not going to happen immediately. I didn’t start seeing any income growth from advertising for about 3 years. Not saying it will take that long but just to give some perspective. Basically, the faster you can grow your pageviews the faster you can grow your advertising income. My biggest piece of advice is to focus on increasing your blog traffic (pageviews) because the more people that come to your blog the more money you’ll make with advertising and all the other income streams. So, how do you get started with blog advertising? Even though you won’t make any real money through advertising until your blog traffic is around 25k pageviews a month – and even then you won’t be able to quit your day job – I still think it’s okay to put a couple ads on your blog. Prior to having 25K pageviews I recommend starting out with Sovrn Media or Google Adsense. Both make it easy to grab code and place it on your blog. Once you hit 25K pageviews then I highly recommend jumping over to Mediavine. They provide complete ad management so you won’t have to worry about advertising at all – simply be the fabulous blogger you are and collect your monthly earnings. I’ve never used Mediavine but I know many respectful bloggers that do and they highly recommend this ad management company. However, the goal is to work hard to get your pageviews to 100k a month so you can apply for the high quality ad management company Adthrive. 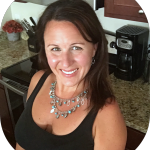 I switched to Adthrive about 3 years ago and it was THE BEST decision I made for my blog. They consistently have high-paying ad campaigns and my income has been between 7k – 11k a month. There are some months I’ve made close to 17k in advertising. If you want to made a significant income through advertising them working with an ad management company like Adthrive is essential. I just want to say one more thing about ad management companies. If you’re intimidated with the technical aspect, or dealing with codes, then handing your advertising needs over to Mediavine or Adthrive is the way to go. They set up all the advertising and are experts in what works best. You truly don’t need to worry about anything. Also, I love the support offered through Adthrive. If there’s ever a problem I can talk with someone right away. They always review my site to make sure it’s meeting it’s earning potential and will make recommendations if it’s not. Last, they listen to their bloggers. If you want to remove a banner, no problem. If you don’t want to show video, that’s fine. It’s your blog and they respect that. Sponsored blog posts, in a way, fall under advertising because you’re getting paid to write a blog about a product, service, or company. You can also be paid to share about the product on social media. Again, just like with advertising, the income potential is based on your reach. This means the number of people who come to your blog and social media pages. Bloggers are considered influencers and the more influence you have the more you’ll be paid. Many bloggers love working with brands and creating sponsored content – there’s definitely money to be made. Sponsored work has not made up a large part of my blog income and just recently I decided not to create sponsored content anymore. This is not to say you shouldn’t do sponsored work but for my blog focusing on other income streams makes more sense. Anyway, you can get sponsored content 2 different ways. First, you can contact companies directly. In most cases this requires a media kit or a least something that shows your current blog numbers. Remember, with sponsored content it’s all about reach. The second way to acquire sponsored content is to work with a company that connects influencers with brands. The company I worked exclusively with was Tapinfluence. I signed up for others like IZEA, Pollinate Media, and Sway Group but Tapinfluence gave me the most consistent work. Not to mention, Tapinfluence hands down paid the best over any of the other companies. Even when my blog numbers weren’t at the level they are now I still made at least $250 a blog post. For reference, my sponsored rate for blog today is $1750 per post. Depending on your niche, sponsored content might be a great way for you to start bringing in a blog income. Affiliate marketing is another way bloggers make money. In simple terms, you join an affiliate program for a product or service. They give you a special link to use when you recommend the product. Then, if someone purchases that product (using your affiliate link) you make a commission. I’ve been working with affiliate program since I started blogging but truthfully I didn’t start making any real money from affiliates until 2 years ago. That’s when I learned affiliate marketing isn’t just about throwing up a few links or banner. There’s some things you need to do to become successful with affiliate marketing. You need a decent amount of blog traffic. More people, more money. Sorry, it’s just the way it is. Blog income depends almost exclusively on the amount of traffic you have. You can’t make money if nobody’s showing up to your blog. More importantly than the traffic, you need to build a strong community of readers that trust what you have to say. With affiliate marketing you’re recommending products and/or services to your readers. You’re saying this is something you believe in. In order for people to purchase products you recommend they need to trust your opinion. You need to know you’re audience. What are they searching for, buying, and/or interested in. Understand and believe in the product you’re recommending. This means if you’re expecting others to spend their hard earned money on something then you should too. It’s easier to make money off a product that you use because you’re able to talk about it naturally and answer questions. Write for Google. This might not seem very personal compared to what I already wrote but people search for reviews about products all the time. If you’re going to write about the product anyway then simply make sure it’s optimized for google. Something as simple as “My Honest Review of _____” can make it’s way to the top of Google. Think about when you search for information about a product. What do you type in? Keep that in mind as you write about the affiliate product you’re recommending. There are affiliate programs for every blog topic you can think of. The biggest one is Amazon Associates. This is a good one to start off with because everyone shops on Amazon and there are millions of products to recommend. Amazon Associates changed up their affiliate program last year making it hard to earn a decent amount of money. However, it’s still available and good way to earn a little extra. The two main affiliate networks I use are Share a Sale and Commission Junction. Both have hundreds of affiliate programs to choose from. There are others but those are the two I use and recommend. If you can’t find an affiliate program for a product then go directly to the their website. Many products offer their own in house affiliate program. Also, many bloggers offer affiliate programs for products and/or services they create. You can usually find out more, and sign up, on their websites. If done correctly, there’s a lot of money to be made with affiliates. I can go on and on about affiliate marketing, but I’ll stop here. However, stay tuned because I plan to share more affiliate marketing tips in future blog posts. Since starting my blog Organize Yourself Skinny, I’ve created 3 different products. The first one was a 4-week meal plan, then I wrote a 67-page ebook, and last year I created an 8-module 25 lesson ecourse. Next to advertising, my own products are the second biggest income stream for Organize Yourself Skinny. I highly STRONGLY recommend creating your own product. I’ve had success with digital products like ebooks and ecourses but I know bloggers that have done very well with physical products like magnets or clothing. The key is to give your readers what they want. Creating a product for your blog takes a lot of time and work but it can be quite lucrative if done correctly. Of course, you need to have an audience that wants to purchase it, a launch plan, and then a strategy to consistently market your product. But, trust me, it’s worth it! When you first start out you won’t have the audience to sell a product to but don’t let that stop you. Having a vision is the first step. As you build your blog also take time to put together ideas for a product and start creating it. It might not be perfect the first time around but eventually you’ll create the most amazing product that your readers will be lining up for. Another way bloggers make money is to offer their services. This basically means working one on one with a client in some way. For example, offering monthly life coaching sessions or nutrition counseling. I never got into offering services but I know other bloggers that do. The bloggers that make the most money through selling services are the ones who have built up a loyal readership. Makes sense. Who’s going to pay someone to be their life coach if they barely know anything about them. 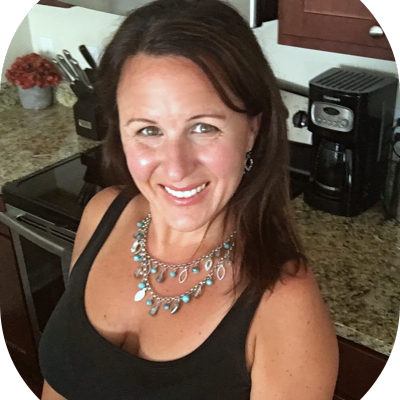 My advice is to build a community, and show readers who you are, before offering services. Take time to prove yourself. This can be done by writing blog posts on the topics you provide services on, sending weekly email newsletters, and being active with readers via social media. Creating a membership site is another way bloggers can make an income. I’ve never had my own membership site BUT I’ve used many. For example, I’m a member of the Food Blogger Pro membership site – this a monthly subscription. I also pay a subscription fee to Haute Stock to use her stock photography. A successful membership site can be extremely lucrative. However, just like with any income stream, money isn’t going to come rolling in overnight. You need to create a membership site people are willing to pay for. It needs to be highly valuable and meet a need. People are more likely to pay a monthly fee if they feel you’re offering them a solution to their problem. Okay, so those are the income streams available to bloggers. I just want to say again that while all of these income streams have the potential to bring in a lot of money if you don’t have the blog traffic, and/or built a community of loyal readers that trust you, then it will be near impossible to create a significant income. My last piece of advice is this, don’t put all your income eggs in one basket. Income streams fluctuate and to survive as a full-time blogger you don’t want to be dependent on one source of income. Of course, you don’t want to go crazy trying to master everything. Find out what income streams work best for your blog and put your focus there. Do you have any questions on how to make money blogging? List them below!